Maison Cartier, the French jewelry house, has launched “L’Odyssée de Cartier”, a 3:31 minute short film focusing on its history, its values and inspiration, its artistic and universal scope. The three and a half minute film follows the iconic symbol of the brand, the panther, around the world where he brushes with key moments and locations from Cartier’s history. 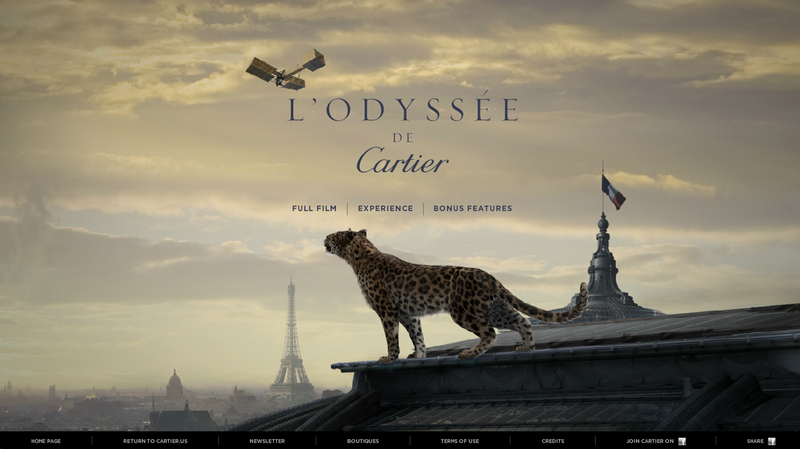 The campaign includes a microsite, odyssee.cartier.com, where visitors can view the film in full, explore the jewelry associated with each setting, and see behind-the-scenes film on film production and music. The Cartier panther (three were used in filming) travels to St Petersburg in the snow, to China where he comes face-to-face with a golden dragon, to an Indian palace built upon an elephant’s back and filled with glittering animal jewellery (many pieces of which reside in the Cartier archive), before leaping aboard the wings of and identical replica of the airplane built by Alberto Santos-Dumont, to showcase the classic Cartier Santos watch (first commissioned by the Brazilian aviation legend in 1904). The panther finally lands in Paris, the birthplace of Cartier, on Place Vendôme where he meets supermodel Shalom Harlow at the Grand Palais. 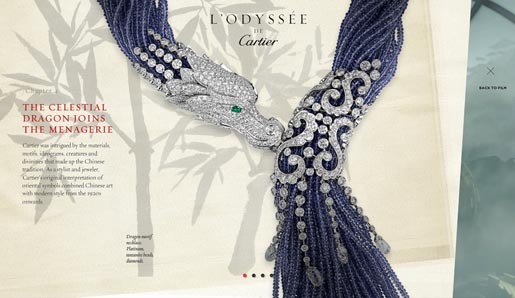 The L’Odyssée de Cartier campaign was developed at Marcel Worldwide (Publicis), Paris. Filming was shot by director Bruno Aveillan via Quad Productions, Paris, with director of photography Patrick Duroux and producer Martin Coulais, production manager Claudia Traeger, dragon designer Stephane Levallois. Graphic sequences featuring Russia and China were by François Peyranne. Post Production was done at Digital District, Paris, by producers Mathieu Lauxerois, Nataly Aveillan, colorist Jean-Clement Soret, editors Coralie Rubio, Fred Olszak, Anthony Ornecq and Rémi Nonne. Music by Pierre Adenot was recorded at Abbey Road. The red dress worn by Shalom was custom-made by young Chinese fashion designer Yiqing Yinwith.